How to arrange your Windows desktop icons and Gadgets? How to change the size of your desktop icons? 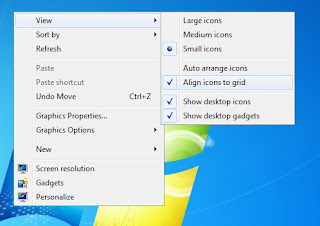 To change the size of the desktop icons, Right click on your Windows desktop then click "View" then select your choice from "Large Icons" or "Medium Icons" or "Small Icons" . How to arrange your desktop icons ? You can arrange your desktop icons in two ways, one is "Auto arrange icons" and the other is "Align icons to grid" . Right click on your Windows desktop then click "View" then select your choice from "Auto arrange icons" or "Align icons to grid". How to hide or show desktop icons ? To hide or show icons in desktop , Right click on your Windows desktop then click "View" then select/check (Tick mark on the left side) "Show desktop icons" . If you remove the tick mark, then all icons on the desktop will be hidden. How to hide or show desktop gadgets ? To hide or show desktop gadgets , Right click on your Windows desktop then click "View" then select/check (Tick mark on the left side) "Show desktop gadgets" . If you remove the tick mark, then all gadgets on the desktop will be hidden.